Can you have fun in your newly installed aquatic masterpiece where your pool and spa are the focal point, while at the same time being a champion of the environment? This is a goal our design professionals at IVYSTUDIO, LLC based in Massachusetts strive to attain when we plan, design and manage your aquatic outdoor project. The correct choice of pool and spa equipment can and does make a difference. Utilizing energy efficient pool and spa equipment is both healthier for the environment and better in the long term for reducing the routine costs of ownership. Among the key pieces of equipment are your pool’s pump, filter and heater. 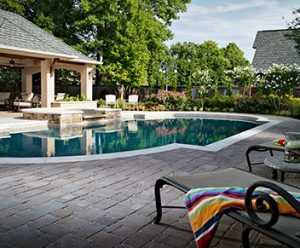 Pool covers can also play a role in enhancing energy efficiency. The pump is vital to performing so many of the key pool functions and there are different types of pumps to consider. In our opinion, and in most of our aquatic projects featuring a pool and spa, we highly recommend the use of a variable speed pump. This state of the art pump utilizes permanent magnet motors with variable speed these units operate at the exact rate needed for each different function prescribed. In other words, the motor runs to provide just enough water flow to perform the task at hand. Their operation is simple and are easy to program, some models coming with pre-set buttons. By choosing a variable speed pump option, the least amount of energy will be consumed for each particular pool function and as such this is the best choice for efficiency. While more expensive to purchase, these pumps can pay for themselves in energy saving in as little as two years. The filter plays a pivotal role in keeping your pool clean by helping in the removal of dirt and debris from the water. With water circulating through the filter, the media or material type inside the filter screens out the dirt and debris. The filter may not appear to be an obvious area to seek energy savings as the filter itself is not an energy robber. However, the culprit is in fact the energy demands the filter makes on the pool pump. Bearing this in mind, the type of filter does indeed have an effect on energy consumption, so this should be part of the quest to make your pool run more efficiently. Of the three traditional media types, the most efficient currently available is the cartridge type filter. The cartridge filter is easier on your pump motor and requires less power draw than sand or DE media types. The cartridge pleats allow more water to pass through them each hour and because of this, filtration of the entire pool is accomplished more rapidly. So using a cartridge type filter will require less pump time, thereby saving electricity. Additionally, cartridge cleaning is easy and from an energy savings perspective, does not use electricity required for backwashing sand and DE type filters. The heater is usually part of our aquatic outdoor projects particularly if they include a spa, as most do. Also, here in the Northeast, the use of a heater does extend the traditional swim season past the warm summer days. The use of heaters do heat up your utility bill, so correctly choosing an energy efficient does make a difference and striving for the most energy efficient backyard resort. Of the three heater types currently available, heat pumps and solar heaters, while more energy efficient, they are significantly more expensive and take significantly longer to heat up over a gas heater. For this reason, most of our aquatic project use a gas type heater and in so=me cases, a hybrid heating system, combining a heat pump with a gas heater. The gas heater relies on natural gas or propane as the source for heating. So, the most critical choice for gas heaters is in the correct sizing based on volume of water and then selecting one which earns high ratings for thermal efficiency. Thermal efficiency is the ratio of usable output to energy input. While impossible to achieve 100 % thermal efficiency, we generally will specify units that are in the eighty plus percentile when it comes to thermal efficiency. The use of covers including solar and automatic safety type covers can enhance energy efficiency when used at night when the air is cooler than the water temperature. Cover use can prevent heat from escaping and thereby convert solar radiation into usable heat. Also, their use can limit water evaporation, reduce chemical depletion and costs and finally keep dirt and debris out of the pool and spa, requiring less use of pool pump and associated energy costs in running the pump. The bottom line is that while your upfront costs for energy efficient equipment will be more, this investment will pay itself back in the long run, and you will be doing your best to ensure that your effort is making a difference on our environment and it’s sustainable future. It pays to go green! Contact IVY STUDIO, LLC at 781-591-0300 or vern@ivystudioiMA.com to schedule a no obligation consultation and lean how we are redefining traditional pool and spa building methodology.